One store that I know is loved by all is Sur la Table- a higher-end cooking store comparable to Williams-Sonoma. I was perusing the website and stumbled across something that I want! Look at these cute Bumblebee String Lights. They would make a perfectly bright addition to my balcony and the description on the site says that they will add whimsy to my home! How is it that shopping for others so often ends with us having new things?! 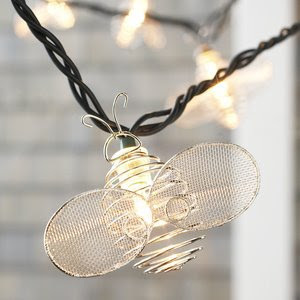 This Bumblebee String Lights is Wonderful!!!! I adore cupcakes too, and I agree, I did not realise how loved they were until I entered the blogging world, now I am surrounded by cupcakes, and people who love and appreciate them. I am continually astounded by the cupcake loving community, its really a place of encouragement and support. My favourite recipe for cooking large batches of vanilla cupcakes is the Magnolia bakeries vanilla cupcake recipe, very easy and works every time. I love this post!! and you may just love my blog :) I am in the middle of a business plan to open a cupcake bakery but for now my blog suffices :) drop by mine sometome. I love the bumble bee necklace; very adorable and whimsical! Toodle and Happy Baking! cute! they must look like fireflies at night!